Happy Monday, everyone. Good weekend? This image of Christmas balls presented a bit of a challenge. The sunlight coming through the French doors was too strong, so I remembered a tip I once read about putting gauzy fabric over the window. I have a linen panel I need to sew for the powder room, so I grabbed that. Unfortunately, there was no way to keep it up, so I hunted for my favorite tool, duct tape. No duct tape, so I tried packaging tape. Which is basically giant Scotch tape. Do you know how long that will keep a linen panel on a French door? About enough time to take two shots. So I shot a couple, retaped, shot again. Oh, my little Maltese decided to crawl into my lap while I was shooting too. He was not happy that I had to keep getting up. There’s another challenge in shooting glass balls. They reflect really well. I saw myself in all the shiny ones, so had to rearrange them so I wasn’t reflected. You can still see me in one of them, but I’m not going to fret over it. 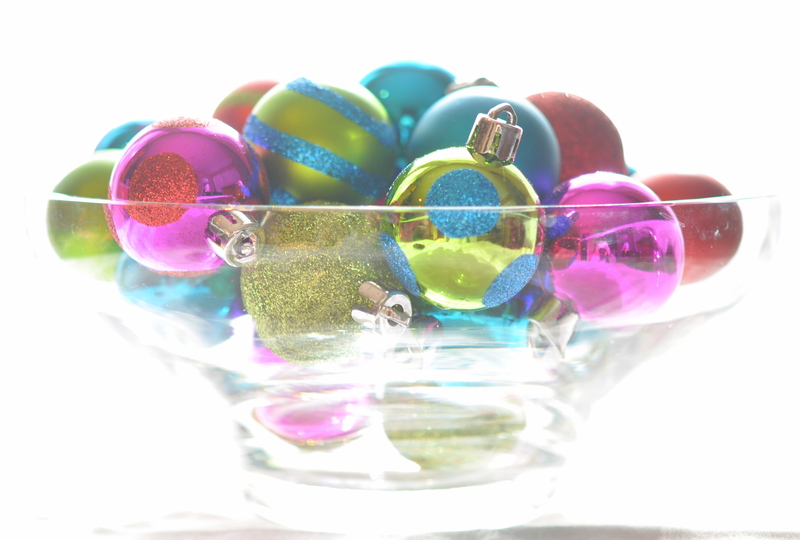 This entry was posted in photography and tagged Christmas ornaments, glass balls, glass dish, soft light. Bookmark the permalink. It was worth the effort. This is simply gorgeous. They look floating…What is really amazing is that it looks so effortless… My cats would make a project like this very difficult. Thanks, Caroline! My dog is pretty good about leaving me alone when I’m doing photography. Now, if I could just get him to stand still when I want to take his photo. Ha! I think I CAN kind of see you! I never would have noticed on my own. Beautiful shot. Love the colors. 🙂 Luckily I have a big lens in front of me! I love the Christmas balls! When I was little, I only ever wanted these on our tree. Forget the other ornaments. They are really making a comeback. I like them both, so wish I could do two different trees! Well whatever you did it was brilliant. This looks like it should be in a magazine!!! Fantastic shot!